These x-ray pictures are worth 1,000 words about how people age that every person should know. 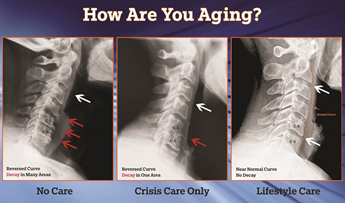 The three pictures represent neck x-rays of three different individuals who are in their mid- fifties with a very similar history of trauma over the years including mild sports injuries, car accidents, and head trauma. No Care: Notice the deterioration of the bone and the disc between C4, C5, C6 and C7. These segments look like a much older person because of the localized bone and joint decay. On the other hand, the segments above look fairly healthy as representing a much younger appearance like you might see in a healthy 20 to 30-year-old person. Yet this healthy and unhealthy appearance is within the same person who has had no chiropractic care to ensure a healthy alignment of his spine and proper function of his nervous system. At times of crisis, this person has resorted to medication and pain relieving treatments such as ice, physical therapies and exercise that masked the symptoms temporarily. Now, unfortunately, this person has really limited range of motion and organic health problems related to the nerve deterioration and the bone deterioration in the affected areas. Chiropractic care is providing relief and increased function and mobility, but a long-term correction may never occur. The symptom-based treatments have contributed to this person deteriorating more comfortably. It only takes one area like this to severely limit your life. Crisis Care Only: The middle x-ray represents a patient who has had Crisis Care only. At times of injury or pain this person would mask the symptoms with medication and only go to a chiropractor to get relief from their condition that the adjustment or other modality would provide. The areas of decay are confined primarily to two segments, C-5 – C6. This person responded so quickly to his Crisis Care adjustments that he never followed through on correcting the underlying structure. This has allowed this patient’s spine and nervous system to deteriorate more comfortably over the years. The deterioration is limiting their function and can be affecting his health on organic levels even while no symptoms are present. Lifestyle Care: This person is showing proper alignment with no decay and a near normal neck curve. This patient has no history of organ dysfunction and no limit in his range of motion or activity levels. The intensity of his Lifestyle Care varies based on the intensity of his lifestyle and can range from one visit per week to one visit per month. We’ve known as early as the early 1900s through the Windsor Autopsy Study that spinal nerve deterioration can cause organic disease and dysfunction. We now know that the impact can be even more significant as it can affect the brain. Research has shown that 90percentsign of the stimulation to the brain comes from movement of the spine. A healthy spine and nervous system is vital to healthy aging on every level. We are getting the advanced notice that our parents and grandparents never received that, whether we like it or not, we will probably live longer than we ever thought. Let’s learn from our grandparents’ generation and make the health of our spine and nervous system, chiropractic Lifestyle Care, a priority during every stage of life and not just wait for a crisis.